As the number of Spanish speakers continues to grow in the United States, understanding the language and Latino culture can be a valuable asset. This awareness is perhaps most valuable in the medical community, where effective communication can make a difference in the health and well-being of patients. While proficiency in Spanish is helpful to enter the program, those who are not proficient may apply, as well. The program requires those who are not proficient in Spanish to take two additional language courses – “Elementary Spanish for Health Professionals I” and “Elementary Spanish for Health Professionals II.” Applicants can take a placement exam from home to measure their proficiency level. 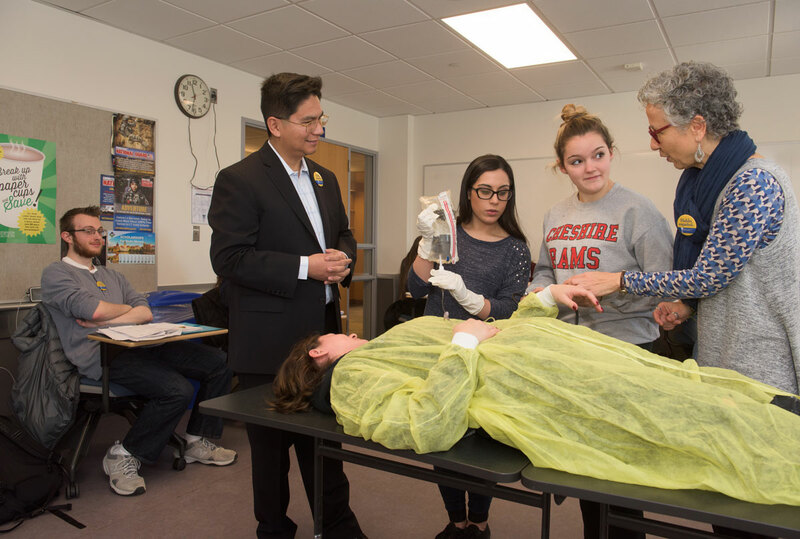 “Upon completion of the certificate program, students will be able to communicate in Spanish with a command of the vocabulary needed to establish relationships with patients and other members of the Spanish-speaking local community,” said William Flores, SCSU associate professor of world languages and literatures and coordinator of the certificate program. Flores said students will be able to complete the program within a year by taking one or two classes at a time. While it is open to people in all fields, the program will focus on health and human services professionals, such as nurses, doctors, EMTs, social workers, speech pathologists and psychologists/counselors. Flores said he is hopeful that at least 20 students will be enrolled by the summer. The certificate program was actually recommended by an advisory board of key community leaders. Flores, a native of Peru, came to the United States in 1993. He holds a Ph.D. in Spanish from the University of California at Riverside. He has 18 years of high school and college teaching experience, and before coming to SCSU, served as director of the Spanish program at California Baptist University. He, along with other SCSU faculty members, will teach the classes. The first course will be taught during Summer Session A. Those interested in the program are asked to contact Flores at (203) 392-5374, or at floresw2@southernct.edu. An application will be posted on the SCSU website at: www.SouthernCT.edu.